This week we see the Cygnet in Rio Harbour, where it has called to replenish stores and take on fresh provisions. From the terse comments in Finniss‘ diary we are led to believe that the decision to call at Rio was taken by Kingston, perhaps acting on John Morphett’s advice, but against the wishes of the captain, and, by implication, the advice of Finniss himself. The simmering tension between these two men probably stems from their earlier rivalry for the post of deputy surveyor, but if we are to believe Finniss, Kingston also quarrels continuously with Captain Lipson and with others. And the disagreements are reflected in petty squabbles between their servants. None of this bodes well for good working relationships once they arrive in South Australia. On the Duke of York meanwhile, Captain Morgan acts as doctor to a member of his crew who has a stomach complaint, but his decision to withhold the sailor’s rum ration is not appreciated. Sugar Loaf Mountain, Rio de Janeiro, 1838. 19th. Standing towards Rio Harbour, after having made it two days before. Found great numbers of The Cape Petrel (often called a Cape Pigeon) is a common seabird of the Southern Ocean. They have a speckled black and white appearance and an 86cm wing span. Cape pigeons , also a larger gull, and one with a yellow stripe down the beak from the top of the head. On the 17th. spoke to Morphett about the impolicy of putting into Rio instead of going to the Cape. It appeared to me that Kingston, instead of taking the advice of those who were selected as his assistants, preferred that of Mr. Morphett on most occasions. This behaviour to Rogers evinced this, on which occasion Mr Morphett again interfered ——– I here allude to Mr. Morphett’s servant having cut down Rogers’ hammock. 20th. Captain Rolls shot Cannon [John Cannan, passenger on board the Cygnet. Cannan ?] in the hand accidentally while loading a firelock. Cannon [John Cannan, passenger on board the Cygnet. Cannan ?] was in the On a vessel with three masts the one at the back is called the mizzenmast. Mizen top. 21st. 11 P.M. Anchored under the Sugar Loaf Mountain at Rio in 15 A fathom is a measure of depth in the imperial system. One fathom is equal to six feet or 1.83 metres. fathoms . Sailed in with Studding sails were set outside the square sails in fine weather and with a fair wind. Their head was fastened to a short yard hoisted to the end of the upper yard and their foot extended by a boom slid out from the lower yard. They took their name, such as main topmast studding sail, from the adjacent sail. studding sails set, as we drew near the anchorage Captain Rolls and the A merchant ship’s officer next in rank below the first mate; also known as a ‘second officer’. 2nd. Mate expressed some anxiety to have the assistance of our people. This assistance was afforded by Mr Kingston, but he ordered all the passengers below on account of some words which passed between them. Feeling the critical situation we were in and Captain Lipson having called my attention to the fact, I went to speak to Kingston on the subject, only because I felt it due to myself to neglect nothing that concerned the general safety. Kingston appeared to be acting under the influence of temper, and I left him considerably annoyed with the result. Though Mr. Kingston evidently [?] himself in what he considered the best manner to promote the success of the expedition, still it was evident to any person of even slight experience that he proceeded on erroneous principles. He certainly deserved the gratitude of the cabin passengers for his exertion to secure them a due supply of fresh provisions, but in every other respect he committed the grossest blunders and acted without the least judgement or discretion. His principal aim seemed to be directed to annoy the Captain, and his demands were most preposterous. This evening as an instance, at ½ past 11 o’clock he insisted upon the A ship’s officer in charge of provisions and meals. steward opening a fresh cask to get him a bottle of beer, without reflecting that at such an hour servants claim the privilege of going to bed. 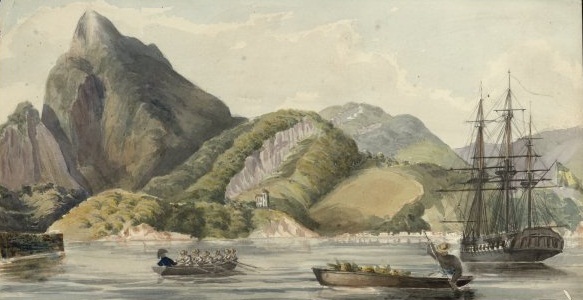 22June At ¼ to 12 entered the harbour of Rio. The anchorage was due West of two islands on the right of the Harbour. S.W. bore Round Island, S.S.W. the Light house. Steered in N. by W. right on the Fort at the right. The scenery on the left was singularly wild and beautiful, consisting of rugged mountains covered with rich wood, except on those spots where the bold rocky projections formed a contrast. The highest land on the right measured 2.30. At the distance of about 2 miles on the left Lord Hood’s nose 2.55! Distance 2 miles. Sugar Loaf 4.31 distant 1 mile. Mountain opposite rather lower. Friday. 24th. Still at anchor in Rio. Kingston and Morphett came on board in a Sailing ships carried various smaller boats for different purposes. A shore boat was an open row boat for transporting people and goods between the ship and shore. shore boat and went off again; was informed by Morphett that they had hired or intended to have hired a carriage to call on the Ambassador: that they had taken rooms at Johnson’s Hotel. 23rd. Went in a boat with the ladies on a picknic expedition. 24th. Arrived the City of Edinburgh, Indiaman, in 49 days from London, Crossed the equator. crossed the line in 20. 25th. Last evening the boat returned with the passengers, all drunk. N.B. Previous to the starting of the boat it was fully understood between Kingston and myself, that he was responsible for everything. Saturday. Ascertained that there were 9 casks left filled with salt water in the fore hold, which the Captain told me he would not start. I informed Kingston on his return the same night. Had stinking water till this day. 26 June. Kingston informed the Captain that he insisted on these casks being To start, applied to liquids, is to empty the container. started . This evening the crew struck work. The Captain caused all the boats to be chained. Read on for a week of high drama. The crew mutinies on the Cygnet, tragedy strikes on the John Pirie, and the Africaine begins its journey with a large body of emigrants on board.